Lost in a wonderland of dreams and half-formed memories, she's surrounded by voices – the doctor, her worried friends and Luke, whose kisses the night of the fall took her by surprise . . . When the accident happened, her world vanished – can Alice ever find her way back? A wonderful modern-day reimagining of Lewis Carroll's timeless classic. 2015 is the year of Alice, 150 years since the publication of Alice’s Adventures in Wonderland, so it’s not surprising that we are seeing some Alice spinoffs out there. 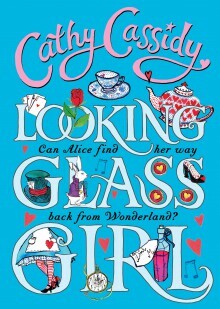 Cathy Cassidy is an extremely popular author for young teenage girls, and her re-imagining of Alice’s Adventures in Wonderland has everything you would expect from a Cathy Cassidy, friendship, bullying, growing up, boys and family. The books starts with an emergency call being placed. There’s been an accident, Alice Beech has fallen down the stairs, she’s unconscious, and there’s a lot of blood. From here the story moves from past to present, and different characters tell their story. We learn about Alice’s move to High School, and how her best High School friends moved away from her, and over the year even started to bully her in horrible, sneaky and nasty ways. As you’re reading the story you wonder why Alice was even at this sleepover with people she didn’t like…but that is all explained. The story and characters of Alice in Wonderland are woven in to the story when we read Alice’s chapters. Alice is unconscious throughout the story, in hospital, hooked up to machines. She is trying to make her way back, and the characters from Alice in Wonderland are telling her that she needs to remember what happened before she can go back. It’s a fairly easy read, and it brings in elements of Alice's Adventures in Wonderland without it being a retelling of the original story.